Objectway, the banking tech firm, has acquired Algorfin, the software and services division of Unione Fiduciaria, the Milan-based bank. Financial details were not disclosed. Algorfin specialises in IT and administrative outsourcing services for asset management companies, custodian banks and other financial operators, through its Archimede, Diogene and Archimede Governance software platforms – very cool names. “This is a significant acquisition for our group as it consolidates our position as leader in the Italian market for banks, asset management companies, brokers and custodian banks,” declares Luigi Marciano, CEO of Objectway. Archimede is a solution for the management of open-end and closed-end investment funds, including investors’ management, NAV calculation, and compliance. Diogene supports the management of all the activities around fund management of a custodian. Archimede Governance allows asset management companies to perform all the checks required by the European UCITS V regulations. 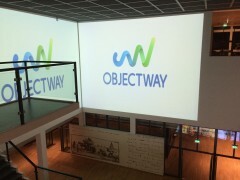 Objectway, which is receiving the whole Algorfin team, says it is achieving approximately €75 million of annual consolidated revenues following this latest acquisition. Unione Fiduciaria will continue to carry out IT and administrative services for trust companies and to provide its own application software to support control functions and whistleblowing managers. Objectway partially financed the operation, with the support of UBI Banca and Unicredit, as lending banks.